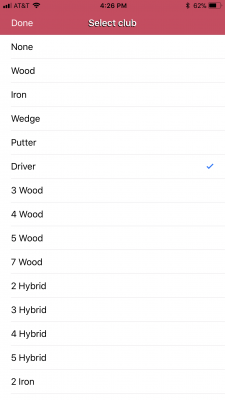 V1 Golf 2.1 for iOS is loaded with new and improved features and a better user interface. But don’t worry it includes the same powerful functionality that made it the most awarded swing analyzer app for golfers. 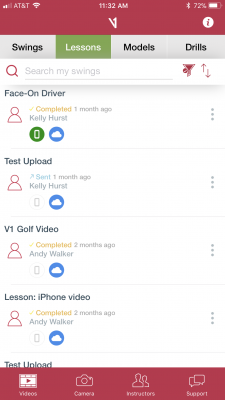 The first thing you’ll notice about the V1 Golf 2.1 app is a cleaner, more intuitive design that keeps your swing videos and lessons better organized. 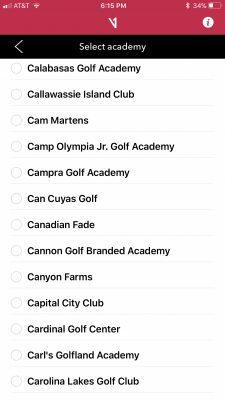 All videos are now conveniently located on the Videos screen with separate tabs for Swings, Lessons, Models, and Drills. We’ve added larger thumbnails, storage icons and important information next to each video. Many of our users have a large number of swing videos. For this reason we have added a powerful new search and sort function to make it faster and easier to locate a video. Now you can search for videos by name, folder, club, view angle, date, or file size. 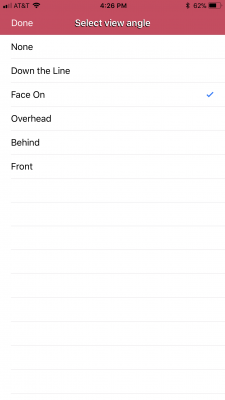 You can also filter and sort videos by date or alphabetically by name. To help keep your videos organized, we have added tag options. 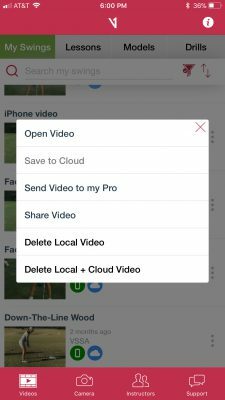 Users can tag videos by club type and view angle. 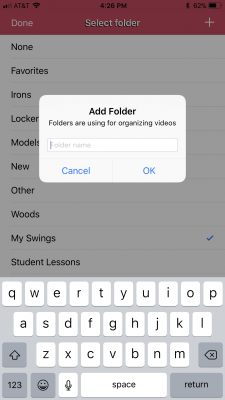 We added the ability to create custom folders to store videos in a way that makes the most sense to each user. We’ve added a new options menu to each video right on the Videos screen so users can quickly manage storage and sharing without having to open the video. 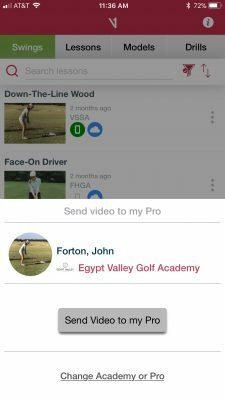 We know the best way for golfers to improve is by taking lessons which is why we made it easier to send your swing videos to a V1 Pro. There are now three ways to send a swing: the new Options menu, the Video Details page, and the Analyzer page. Swing videos that are sent to a V1 Pro move to the Lessons tab and are labeled Sent. They will be labeled Accepted when the Pro Accepts the video, and Completed when the Pro has sent back their analysis as a lesson. We know that the best way for golfers to improve is to take lessons. 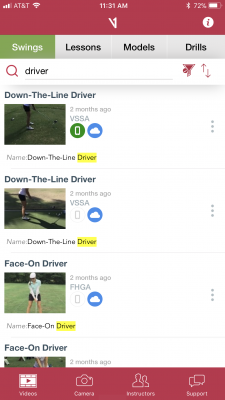 This is why we made it easier for golfers to connect with an instructor by adding the V1 Pro directory to the main menu. 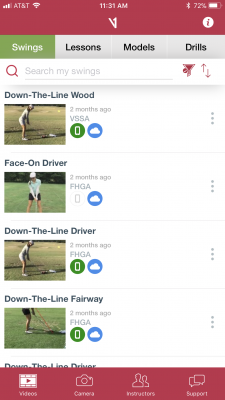 Now golfers can search and connect with their golf instructor for analysis and video lessons. If you are a golf instructor who wants to be featured on the V1 Pro directory, please contact sales@v1sports.com. Now all analysis tools are conveniently available directly on the analyzer screen so users can quickly switch tools with one-touch. Tap less, draw faster, improve more! To ensure that contacting us for support is quick and painless we added a one-touch support to the main menu. This puts you directly in touch with a customer support representative. 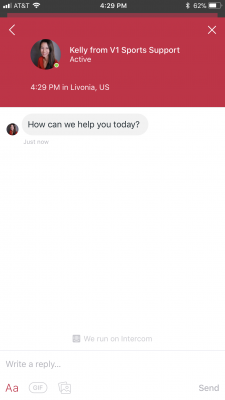 Just tap “Support” to start a conversation. Our support hours are Monday - Friday 9am - 5pm ET and replies are typically within 24 hours.